Two gates connected to stone walls. When you open a gate, one gate will be higher than the other. -Place down 2 gates left to right. -Place a cobblestone or mossy cobblestone wall to sides of gates. The gates position will change. One gate higher than the other. 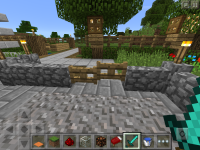 MCPE-10672 Able to walk through closed double fence gates attached to cobblestone walls.